The 1.10 version sees some major but subtle changes. 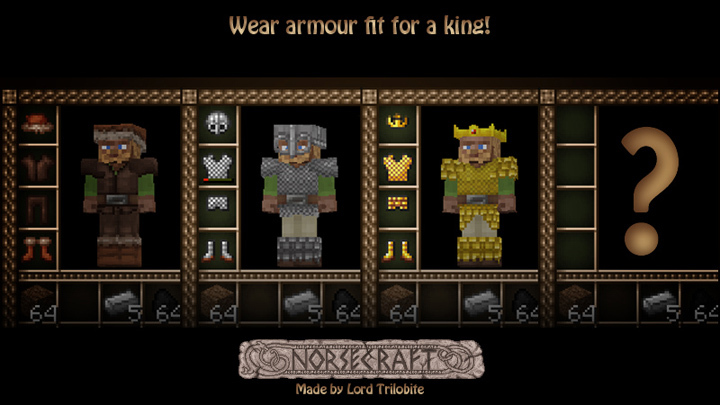 After receiving a great many requests for some new iron and diamond armour, I have updated them. I really try to leave the textures from the original artists untouched but the requests have been very convincing. I tried many variants and finally decided keep as true to the base concepts was best. I hope you like them. 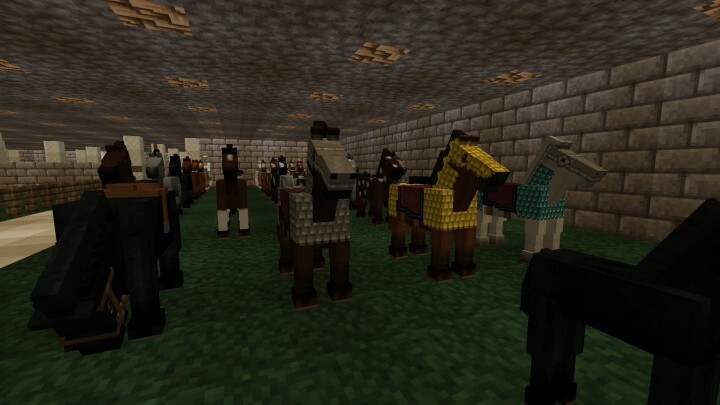 The horses are now in the stables and the armour polished for battle! It took me three attempts to finally get the armour as true to the spirit of LTN as I wished. I am pleased with these. Charge!!!!! Lord Trilobite created this excellent work of art. It has been languishing since 1.6. I finally found a way to contact Lord Trilobite and he gave permission to bring it up to date (see the comments in the original thread link above). What a pleasure to work with these textures. 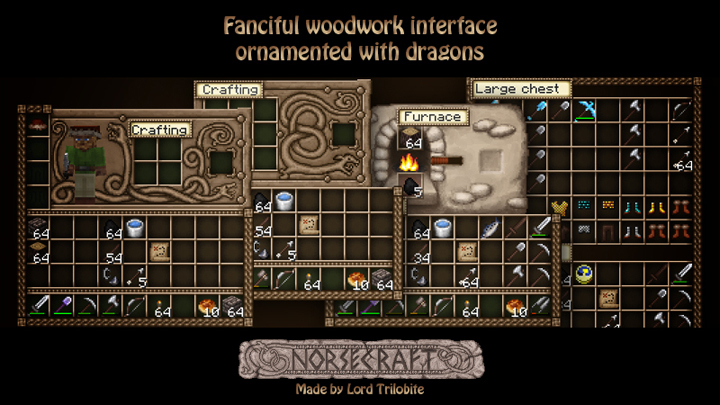 Norsecraft is simply excellent and I hope you enjoy playing with this resource pack as much as I did making the new textures. Please tell me what you like and, especially, what you DO NOT like. For the things that are not right, if you can tell me why they are wrong there is a good chance I will fix it, well at least try. Hey just got back into minecraft and tried to load this into my android and I'm getting an error saying "unable to find manifest in pack" just wondering if this is fixable because I'd love to use this pack! Hello. 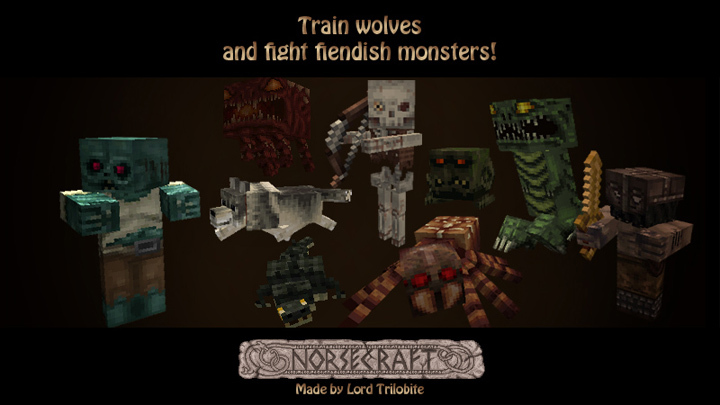 What's the word on updating and keeping this resource pack alive and up to date with Mojang releases? 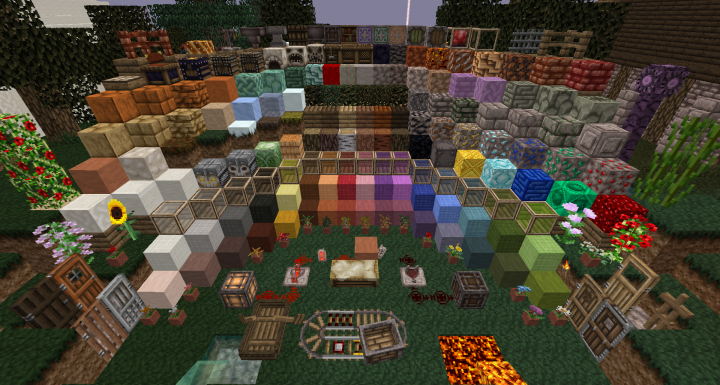 This resource pack is, simply, astonishing. Will this be updated to match Minecraft version 1.11? the Norse experience isn't, at all, existent in 1.11. I decided to make a critique video for this pack. It's been one of my favorites forever so I'm really happy to finally give it a review. I hope that you all enjoy it and maybe find some insight that will be helpful. Feel free to remove this if you don't want me posting my videos here, or just ask me to remove it and I shall. I like this a lot. Will it be updated to 1.11 once it's not just a snapshot? Like, adding the texture for the observer or something? Easily my favourite resource pack. It has such a strong and resounding theme. The download that is showed seems to be missing files,because when I place it into my resource pack folder only a few texture are changed not those shown above. hmm, this is hard to diagnose. What version of MC are you running? I downloaded and checked the zip file and it contains everything I expected for MC1.10. I am glad to to help. Oh good that you found the problem. Have fun. 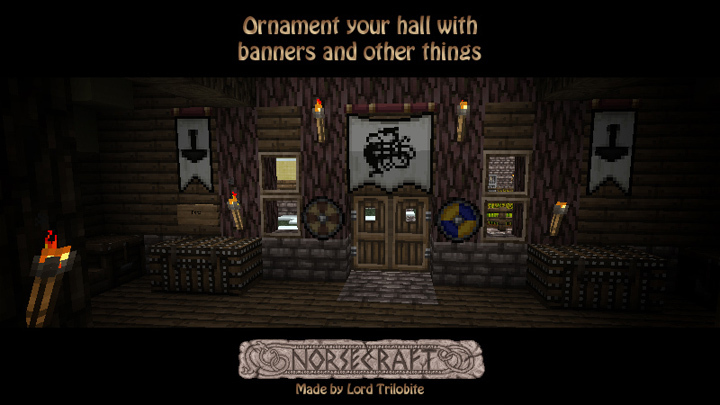 This is a fantastic resource pack! With my household's appreciation for all things Old Norse, this is a great treat. There's even a genetic link with these folks from way way back when, like, 1000 years, ish. I, in fact, am using it for my personal server on a Raspberry Pi 3 and using Craftbian for the admin dashboard. I'm just working on a way to prep it for download using the resource-pack line in server.properties, which is giving me some problems. Thank you, Ragnar. I am impressed with your setup. I dont agree about new diamond armor. It looks cool, but also breaks the original spirit of it ( wich was intended to be a Berserker warrior ). Iron armor is nice tho. Out of that, you are doing a very nice job as usual. I had a great problem making a decision on this. I actually agree with your opinion. I received so many requests to have armour that you can see and identify easily. You have given me a fantastic idea!!!!! Look for it in the next release. As a nord, i approve. 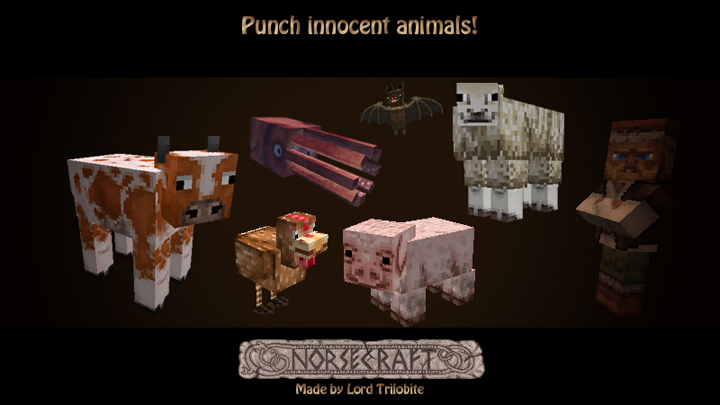 Also Minecraft belongs to the nords? LOL, I tried to keep the shield authentic so I searched for actual artifacts, and thus I made the shield round. Do you have a better suggestion for the pattern. I don't know much about the shields, but maybe some "engravings"? Im real glad of see this texture pack is keeping alive, it was always my favourite one. I hope you will do a nice job with this man! And i thank you and Lord Trilobite for it. I will certainly try. I hope I do it. So you know emeralds are untextered same as the lock difficulty button in the menu for singleplayer. Thank you, I am making my way through everything. Expect to see these fixed in the next release plus the 1.9 textures that I have been making also. I know why Lord Trilobite made the diamond armour as it is. The Vikings believed in magic and its powers of protection. A necklace could make you invincible. Thus, this minimalistic armour would provide the best protection ever. I will consider your suggestion but I think Lord Trilobite got the lore correct. I just didn't have the time to keep it up to date all the time. Though I saw it's still missing some key features like the horses and their armour. Exactly. I have started horse armour based on the styles of the human armour, I am not satisfied with them yet. I expect they will be in the next update. I have been trying to find authentic references to Norse tack but so far I can only find a single reference from the Oslo Viking Ship Museum. More refs from the Rus but you can see the eastern influence. Why only 95% finished? What's left to do? Could you maybe make a 3D models add-on or sounds? Just wondering what's next. LOL, thanks. There are a couple of items that are not quite there yet. I did not want to put 100% until I was absolutely sure. Damn, that nostalgia. Thanks for bringing those memories back! Thank you so so so so much for this. You are the best! No worries, it was a labour of love. Thank you, I have been working on this for a long time but only just got the permission. May I get back to you on the pumpkins. If only customisers still existed. hmmmm. Hey! Awsome texturepack, goes with my skin! i made a review on this. hope it helps you out. https://www.youtube.com/watch?v=bjqw-m1ORpA If you can showcase i would be highlt gratful! maximum WIN. i know i'm not the only one who hoped this pack would be revived. well met! Congrats and thanks for brining this one back! Was always one of my favorites! That little silverfish as a lizzard - brilliant! It looks awesome, but the downloadlink doesn't work for me! Oh dear, I have tested them again (I test the links before I publish) and I get the download. What happens when you click the top yellow button? Ok, I have no idea what went wrong the last time I tryed, but now the link worked, and the Pack is just amazing! I love it! Thanks for bringing it back to life!